Our juror will be Kirk Hinshaw. Kirk is an outstanding collage and assemblage artist. His art work has garnered numerous awards, been exhibited throughout the US and is currently in private collections on both coasts and in Europe. Kirk serves as President of the Arts Guild of Sonoma. Artists from Northern California are invited to submit entries into this juried show organized by the Santa Rosa Arts Center at Chroma Gallery, located at 312 South A Street, Santa Rosa, California. 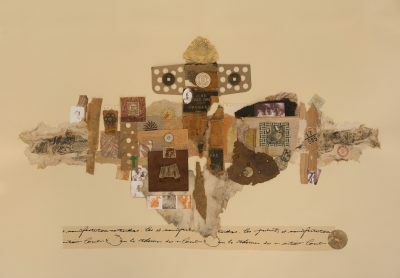 Artists are encouraged to explore wonder and whimsy in the mediums of collage and assemblage. Unexpected combinations of themes and mediums are what we are looking for in order to delight, surprise, provoke, and to blur the boundaries of the two- and three-dimensional. Work intended to be hung on a wall must be wired for hanging.We invite works that do not fit traditional definitions and there will be table and pedestal space available to show free-standing works. Size is limited to 42″ in any dimension. Unsafe work may be rejected. Step one: Submit art for jurying as JPEG or PDF only to submissions@santarosaartscenter.org. Three pieces maximum per artist. Information Required for each submitted piece: artist name, titles of art, media, dimensions, email address.